Online Monitoring and social media monitoring are nowadays fundamental components of a modern communication strategy. In addition to classic media, social channels such as Facebook, Twitter and LinkedIn are playing an increasingly prominent role in companies’ communication strategies. Online monitoring has become an important pillar of modern PR work in recent years. vibrio uses Brandwatch as a tool for this purpose, based on many years of positive experience. 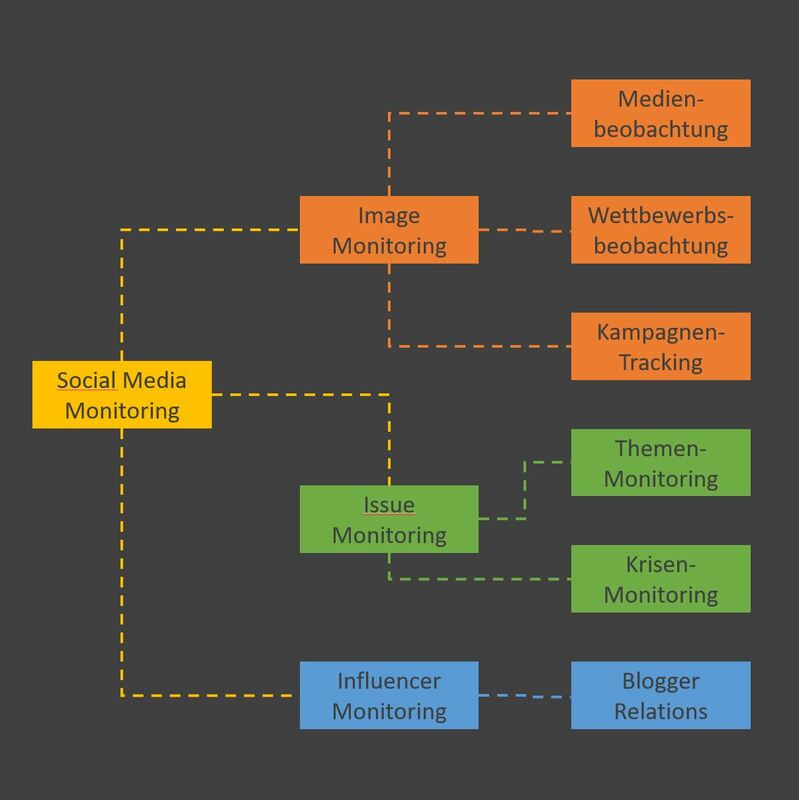 Professional concepts for observing and monitoring online sources distinguish between three core areas of analysis: image monitoring, issue monitoring and influencer monitoring. Traditional media are increasingly shifting their business into the digital realm. Contributions and exclusive content appear online, research is done on the web. Customers demand support via Twitter and make purchase recommendations on Facebook. Opinion makers promote and start trends on YouTube and in blogs. The biggest challenge for public relations work in such an environment is the sheer scale of the sources and content. Traditional clipping services do not or only incompletely capture these digital conversations. Important input is thus lost, mistakes, misunderstandings and displeasure remain undetected in the worst case: a shitstorm occurs. The observation of the market and the competition has never been so easy as it is today – assuming the right tools and partners are available. The right online monitoring concept creates flexibility and opens up valuable opportunities. The direct contact to the target group is an important indicator for the respective acceptance on the market and in the public per se. How do my fans tick, what attracts and what doesn’t? Social media monitoring helps to recognize and classify conversations about brands, products, campaigns and events on the net (image monitoring). Activities that damage the image of brands and companies are also discovered more quickly, a mandatory prerequisite for counteracting them at an early stage with appropriate reputation management. Successful crisis PR requires professional issue monitoring. Image monitoring covers much more content than the conventional clipping service, which usually focuses on print results. Many exclusively printed media reports are now discussed online. If set up correctly, social media monitoring can largely replace the classic clipping service. Professional online monitoring provides PR managers with an overview of the trend topics that are particularly interesting, hotly debated or emerging for their own target group. It provides important input for a communication strategy based on storytelling and serves as an early warning system in the run-up to crisis situations. Important opinion leaders, multipliers and bloggers can be reliably identified and their activities tracked with the help of consistent observation. This influencer monitoring is an integral part of online monitoring and can be used afterwards for targeted addressing and collaboration (e.g. for blogger relations). In the social channels, one quickly comes across tasks that can no longer be mastered by means of manual analysis. Social media monitoring tools provide a remedy here. Their so-called crawlers browse the net on the basis of parameters previously defined by the user and display all search results clearly. The unimportant is filtered in online monitoring, the significant is made visible. Web-based, freely configurable and interactive dashboards ensure an overview of all relevant mentions on the net – in real time, of course. The scope and approach are adapted to individual customer needs, because the best online analysis is of no use if it does not add value in day-to-day business. vibrio offers the professional online monitoring solution Brandwatch Social Media Monitoring in all its facets: from image monitoring to issue monitoring to influencer monitoring. Brandwatch is one of the world’s leading social media monitoring platforms. Our service is expressly not limited to the purely technical support of a social media monitoring tool. Our strength lies in particular in the strategic communication analysis of the data determined by online monitoring. What are the consequences for communication work? Where are there opportunities or possible risks, where is there potential for improvement? Which topics should be covered within the framework of a storytelling strategy? Which influencers should be additionally addressed? There is no point in simply finding something if one does not derive action alternatives from the found object at the same time. vibrio supports companies in the development and implementation of their individual social media monitoring concepts. The spectrum of our services ranges from purely technical services, which are limited to the delivery of the results, e.g. 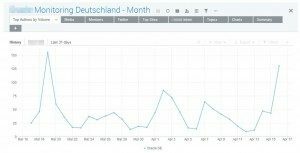 as dashboards or Excel tables, to complex analyses with concrete recommendations for social media marketing. Information and examples for the practical implementation of online monitoring, suggestions and reports from industry events can always be found in our DampfLog blog.